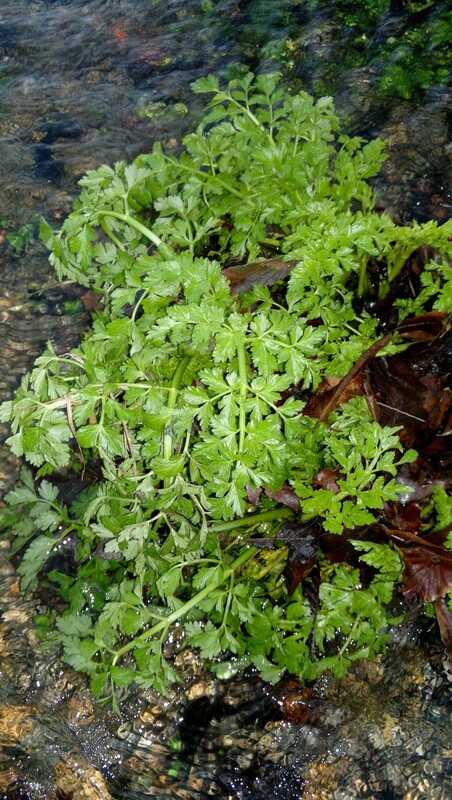 Hemlock water-dropwort (not to be confused with its equally toxic cousin hemlock (conium maculatum) is common in shallow water and wet ground throughout the UK, especially ditches, slow-flowing streams and on foreshores. 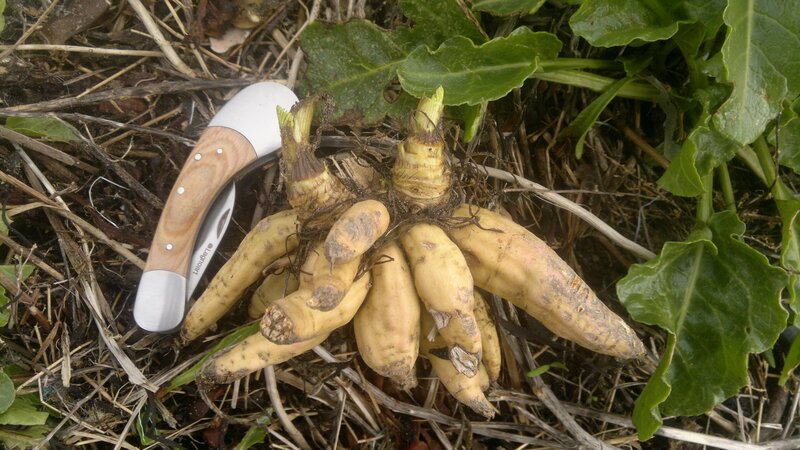 It has been mistaken for wild celery or water-parsnip – be very careful when IDing either of these for eating, or indeed any member of the carrot family. 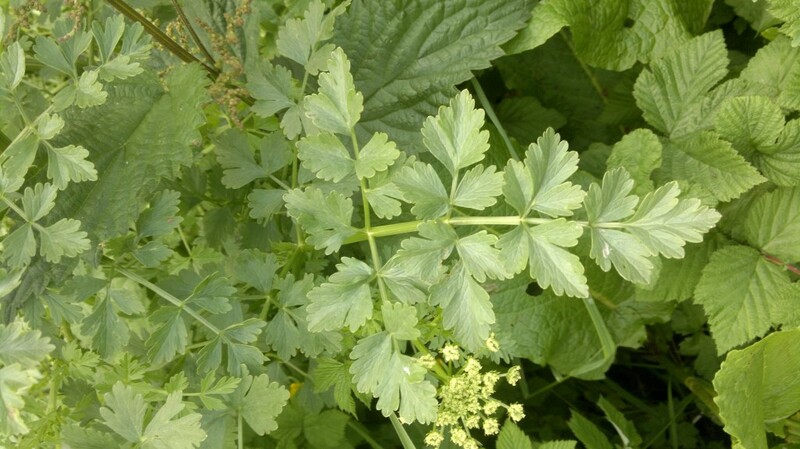 All parts of hemlock water-dropwort are potentially deadly. Look out for distinctive carrot family leaves (3-4 times pinate at base) growing from or near water, strong unpleasant smell when broken (like acrid celery), hairless hollow grooved stem and white swollen roots. Both foragers and dog walkers should familiarise themselves with the distinctive “dead man’s fingers” of hemlock water-dropwort roots. These are often exposed on river banks or washed up after floods or high tides. Most years they result in the deaths of several dogs around the UK after winter storms. Regardless of its toxicity, I am very fond of hemlock water-dropwort. Its growth is remarkably vibrant from December through to June. In dark winter months where not much is growing, it is easy to spot by its vigorous green growth in damp spots – often growing directly from water. Winter is a good time to “tune in” to it, before it gets mixed up with other plants. Be particularly careful if harvesting watercress or pie cress in the spring – they are regularly entwined with HWD. 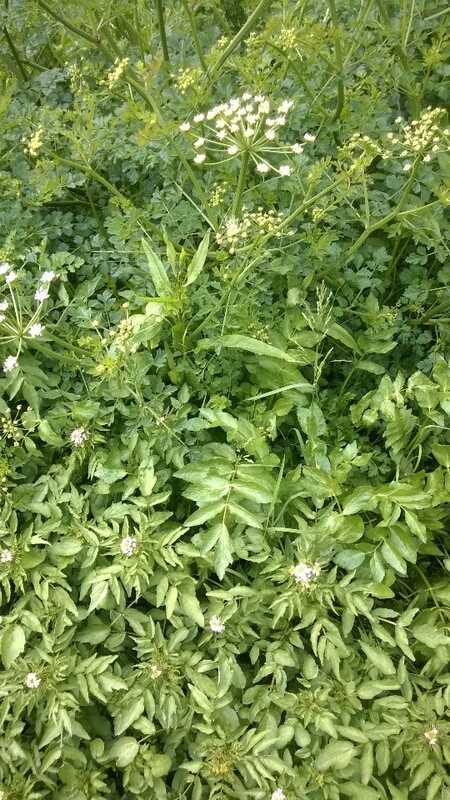 Hemlock water-dropwort, watercress and pie cress, sharing a ditch. Careful now! 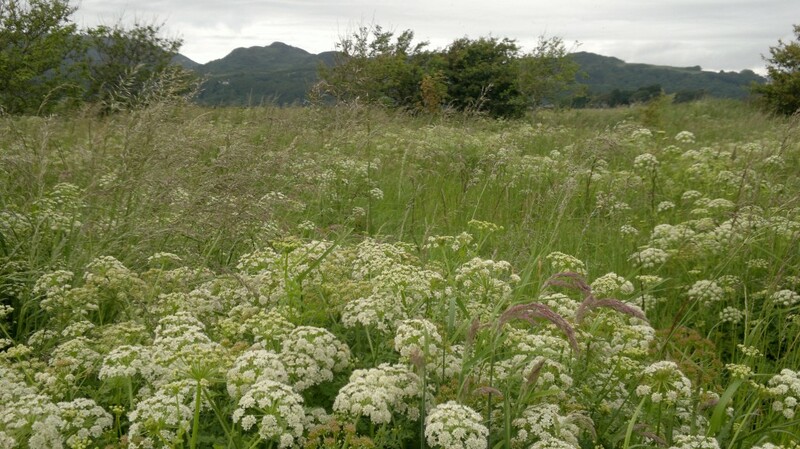 In the spring and summer, its rounded umbels of small white flowers are a rich source of food for hoverflies and other insects, and wetlands can look spectacular festooned in their white baubels. HWD has a fascinating history. Its very toxicity once held it in high esteem when capital punishment was more common, and easy methods of execution valued. 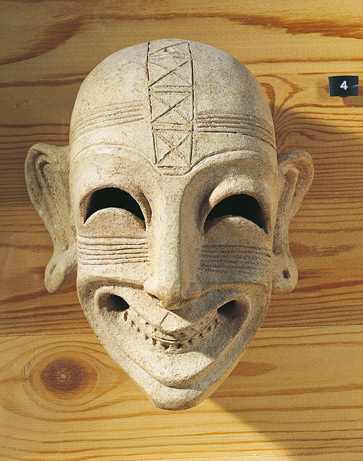 A “sardonic” smile, is a direct reference to the widespread use of HWD in Sardinia where a decoction of its roots were used to administer death sentences. 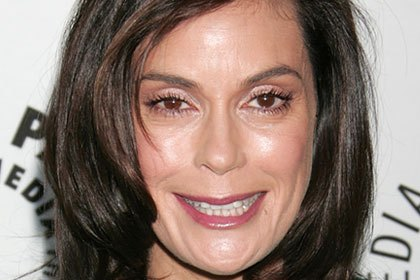 As this powerful muscular convulsant stopped the victims heart, it would also act on facial muscles, drawing the face into a grim “Sardinian”, or sardonic, smile. Awesome and informative. Love your photos too! Thanks. You are awesome. thanks graeme, I just sent you an email. Very informative article, did not realises how dangerous this plant was. Will point it out now to my grandchildren. Never knew this, thank you for such an informative website. One mammoth question. Since I live in Italy, is there a possibility of adding a distribution map of the species you consider? I have a butterfly and bird app. very useful in this respect, well worth the price of an app. There is a serious limit to how wide I can cast my net – and how much time I can apply to this, free of charge!